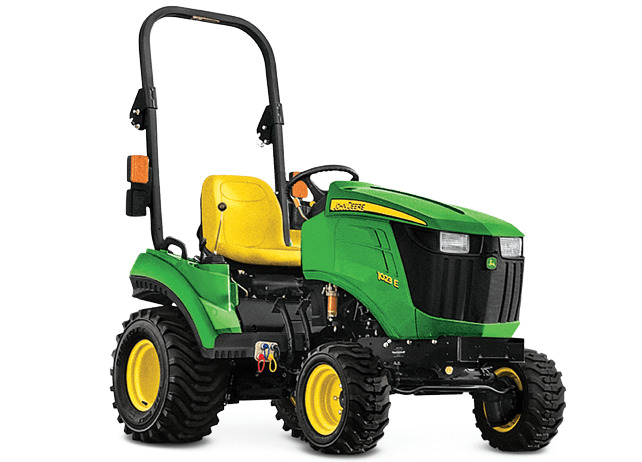 The special features and capabilities that go beyond the standard ensure the John Deere 1023E has the power and performance to practically do the work for you. With an adjustable seat, Twin Touch hydrostatic transmission, and easy identification with color-coded controls, the 1023E was created for an Ag professional or first-timer in mind. Twenty-three different John Deere and Frontier compatible attachments like the overseeder, power rake, sprayer, mower, and rotary cutter ensure there's no chore you can't tackle. Build your own tractor package with the specific attachments you need to get job done. Some restrictions apply. See dealer for details. Offer ends 1/31/19. Find the tractor that's right for your property at the location nearest you. Discover what savings you can experience with our year-end deals!